I have a pet peeve. I don't want to start ranting here but for years I've been irked by people who believe that before & after photos are the absolute proof - the litmus test - of whether or not a training program works. Last month I got an e-mail from someone who literally said, "Science and numbers don't mean anything without photos that show proof." Listen, I've been around this fitness game for nearly twenty years now and I can tell you without reservation there is nothing - absolutely nothing - more rife with outright fraud than the before & after photos that accompany diet, nutritional supplement and training program ads. As this is written (Feb 2009) one of the fashionable, hyped diets right now involves the acai berry. This obscure little berry is just the supplement de jour and in a few months it will be replaced by some other obscure fruit, vegetable, bark or root that will be sold the same dishonest way with claims of fantastic fat loss, huge muscle gain and enormous increases in energy and vitality. Question: If you had a product that really worked, would you resort to the following tactics to sell it? Meet Nicholle, Kathy and Jenny! Notice the photos of Nicholle Stevenson, Kathy Thompson and Jenny Conrad? They look quite similar, wouldn't you say? Also notice that they lost 35, 23 and 25 pounds respectively. 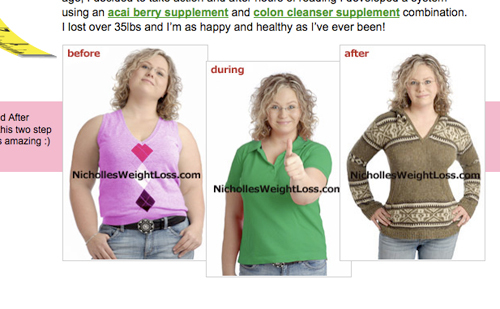 I copied these images (took screen shots, to be exact) from three different websites designed to look like personal blogs of women who are telling the world about their diets and weight loss success. The first thing you notice is that every "personal blog" is almost identical in content, including YouTube clips about acai berries, undoubtedly unauthorized photos of Oprah, personal details involving husbands and children, etc. My personal favorite is the fake "comments" cheering about the product and saying "I'm ordering right now." And get this - the fake comments use IP filtering so if you leave a message telling everyone "this is total fraud and a scam" the only person who sees the post is YOU. How clever is that? Evil genius, I'd say. Here are some "before, during & after" photos of how Jenny and Nicholle's "diet" worked. You Ain't Seen Nothin' Yet! 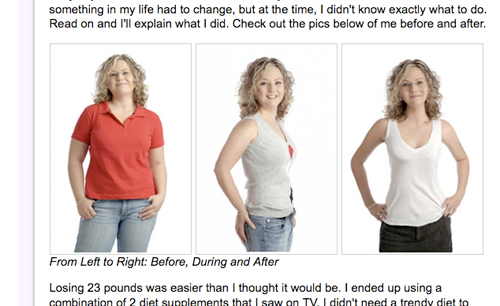 And here's a before & after photo of 'Rachel' from www.rachelsdietadvice.com with the same layout and other bogus info. Since when does a woman who's lost 18 pounds pose in the same outfit for the 'after' photo? And what is she wearing in the second photo? A skirt? Pants? The black is pure color and no texture. It's been Photoshopped. 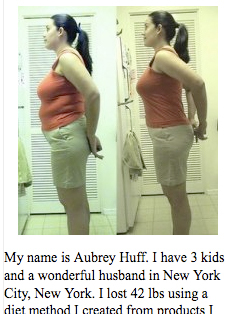 Here's the photos of 'Aubrey' taken from www.aubreysdietblog.com that also duplicates the identical format as 'Rachel's' site. 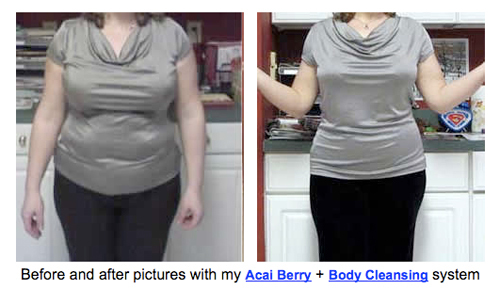 Another photo of a woman who allegedly lost 42 pounds and then posed in the same outfit for the 'after' shot. Yeah, right. When a woman loses a whopping 42 pounds would the same shorts even fit? And would they have the identical wrinkles over the hamstring area? Now meet Maria Stevens and Tina Collins. 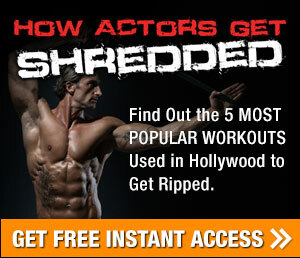 They don't really look alike but you'd be surprised to see how similar their before & after abdominal photos look. Maria and Tina also have virtually identical websites. And here are their before & after abdominal photos. Yes, they both say these photos are their abs. Two different women - same before & after photos. Hmmm. By the way, there is no "1 rule" to obey. They just want you to sign up to buy the nutritional supplement on an automatic billing plan that dings your credit card for 100 bucks or so every month. And good luck trying to cancel your order when you're dealing with guys who create fake photos and fake blogs to sell a fake wonder food that they claim causes weight loss. 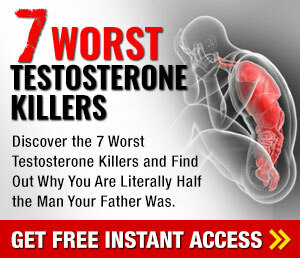 All these scams are predicated on the belief that the brightest biochemistry PhD's and medical MD's from the best universities in the world who have dedicated their lives to difficult sciences can't find a quick fat loss drug or food ingredient but some yahoo in the rainforest can easily create a juice that does. 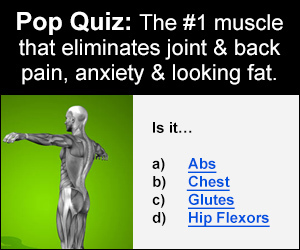 Question: If Pfizer, Merck or Glaxo came up with a juice or pill that really, really caused 30 pounds of fat to melt off in 8 weeks how many trillions of dollars do you think the company would be worth overnight? If acai berry showed any promise whatsoever don't you think Wall Street would be all over it? Can't you just hear Jim Cramer yelling "Buy, buy, buy!!" Nope. Nobody on this earth has a quick fat loss product. Nobody. And I'll repeat my question: If you had a product that really worked, would you resort to fake photos, fake blogs, fake user comments and fake names to sell it? Because these fake diet program photos and others just like them are everywhere, extreme results like this become the standard in people's minds; this is what they think they should quickly see for their meager efforts. People expect radical transformations like these from a few weeks of drinking fruit juice. That is a crazy expectation. But these images have been displayed literally millions of times every day on some enormously busy websites. The same thing happens with muscle photos and hair loss and every other opportunity to persuade people with before & after photos. In the end, some people think "science and numbers don't mean anything without photos that show proof." The reality is science and numbers mean everything; they are the foundation of reason and human advancement. Finally, strength workouts for the thinking person... 10 exercises.....5 seconds each....All the muscle you want! Guaranteed.